Well, to point #3, it’s more than just me. I wrote what Vince calls “right“, and that Dave deBronkhart (e-Patient Dave) also cites, when I was in the hospital and observed the system up close and personal, and found that others have been advocating Patient as Platform for a long time, though with different names. Kudos to all of them. I have one small quibble, and that’s with the word “consumer.” Patients today no longer only consume. They produce. What they want and need is more responsibility for their own health care. More importantly, a patient cannot be a platform if he or she is only consuming. By nature and definition, a consumer is a subordinate creature. It lives downhill from the flow of services. Platforms stand below what they support, but are not subordinate. They are the independent variable on which the variable ones standing on it depend. For more along these lines, follow Adriana Lukas here, where (among other things), she has MINT, which stands for My Information Not Theirs. Why should marketers be interested in VRM? Because, given a choice between a product that isn’t really addressing their needs (CRM) and one that is (VRM), customers are more likely to opt for VRM. In other words, VRM is a game changer. A VRM filter helps create a new operational and innovation agenda. The simple question ‘how does this help the customer achieve his or her relationship management goals’ can go a long way to predicting which initiatives will stick, and which won’t. Creating systems to recognise customers at every touchpoint and treat them in a seamless fashion looks pretty good under this spotlight. Profiling and propensity modelling for the purposes of direct marketing? Not so sure. Who owns the customer relationship? Is it the customer? The vendor? Both? I think this is a trick question because a relationship is a duality that exists independent of both parties but requires both to exist at all. In fact, the relationship becomes an entity of itself, a mass-less, weightless entity but a reality nonetheless. Substitute the word marriage for relationship and you see my point. I advocate thinking about the relationship as an independent entity, one that has to be nurtured from both sides. And that drives my thinking on social CRM. …the company owns the company, the customer owns their own personal value chain so to speak. That’s why there is a difference between SCRM and VRM. Vendor Relationship Management is what the customer does to command their side of the relationship. SCRM is what the company does in response to the customer’s control of the conversation – and all the other things associated with that. But the company still owns itself – meaning its operational practices and its objectives and its records and its legal status as a company. Companies are increasingly being pushed to respond to customers and that is where SCRM begins to show itself. So let me put it this way. 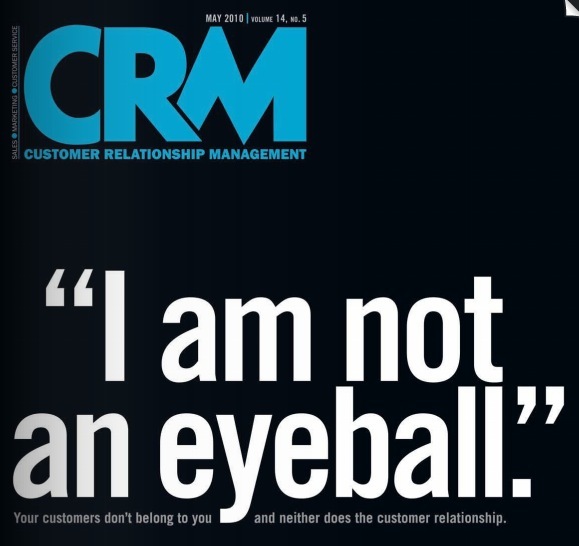 The final line of my definition of CRM says, “Its the company’s response to the customer’s control of the conversation.” At this time, the ongoing way that the company responds to the customers control of the conversation IS the relationship. Thanks to Chris Carfi for pointing us to that thread. In this passage she describes how modern markets work (or, to be more precise, our prevailing mental model of how they work). They display at least five defining characteristics. Consumers are exercising choice (but only from among the choices that producers have decided to offer them). Every consumer in every category is on a journey from novicedom to connoisseurship: most of us are neither novices or connoisseurs, we’re somewhere in the middle, learning. This learning is achieved almost entirely via DIY methods (there are no GSCEs or degrees in shopping). Aside from advertising, most product information is inseparable from the product itself: we go to market to inspect the product, to understand its features, attributes and qualities etc. To learn, in other words. … designed and distributed in furtherance of the seller’s goals, i.e. to persuade the buyer to buy. An increasing proportion of the information that’s made available about the product is separate from the product itself: e.g. online. … so an increasing proportion of this information addresses the consumer’s goal of making better decisions, rather than the seller’s goal of influence. These last two developments mean that learning about products and markets isn’t just a DIY activity any more: specialist services (search, comparison, peer-to-peer advice etc) are emerging to help consumers on this front; to provide them with the information they need; to help them become more ‘professional’ in their product judgements and choices. The more consumers get to understand what’s available and what’s possible, the more the process of arriving at a decision changes – from ‘choosing from among the choices presented to me’ to ‘building a specification of what I would like, and then finding the best fit’. What this means is that we are in transition. Let’s accept that sellers will always want to influence consumers’ decisions in their favour and that consumers will always want to make better decisions. That’s not changing, but how they go about these tasks is being turned upside down (or, to be more precise, right side up). For many decades now we have lived in a seller-centric market largely shaped and defined by marketers’ quest to influence consumers’ decisions. Consumers have had to pursue their goals within this context. We are now moving towards a buyer-centric market shaped and defined by consumers’ quest for better decisions, with marketers having to pursue their goals within this context. This is the “tectonic power shift”, the “dramatically altered” balance of power between companies and consumers that McKinsey so rightly referred to. Using current communications tools it is possible to find, understand, communicate and satisfy people who at the moment are looking for particular object, not only its perception. I think people taking under consideration different choices than offered by brands feel risk related to possible lost of this “magic”. And they are right, because brands satisfy their needs of “magic”. How this “magic” works? People have a tendency to mix up subject of perception and method of perception. For many people “story about facts” is the same as “facts”, “knowledge about something” is the same as “something”, “self perception” is the same as “self” (this mechanism was described many times, even in European Middle Ages as “medium quo” and “medium quod”). This distance between perception and reality is reduced by authenticity, and therein lies the problem with branding itself, of the current craze around “personal branding,” and why the latter is oxymoronic. As everybody above make clear, VRM is something that happens on the customer’s side of his or her relationship with vendors (or with any other entity). As Jacek suggests, real relationship requires authenticity. For that, traditional branding is largely a side issue. In fact, I suggest that all branding is essentially a distraction. I might even suggest that nearly all marketing is too. That’s because marketing is still mostly about push. Let’s face it: pushing is what most marketers get paid to do. But pull will outperform push, because it will involve less — or no — guesswork. It will be based on what the customer actually wants, rather than what vendors want to push at them. Back in 1997, before blogging got started, I wrote two pieces no publisher would touch, both about “push,” which was then a big buzzcraze: Shoveling Push Media, and When Push Comes to Shove. The craze went away, but the urge to push hasn’t, and shouldn’t. Sellers need to let buyers know what they’ve got and why it’s good. But the waste involved in blasting out message, and “branding,” is huge. And it wastes more than money. Bonus link: VRM is #15 on Web Design Cool’s list of 21 Twitter Tips From Socially Savvy Companies.